Who doesn't love a bit of sparkle, glamour and dressing up? I'm sure you can tell how much I love vintage fashion by now, so when Farfetch challenged me to recreate an iconic movie outfit, I knew exactly which film I would choose. Baz Luhrmann's "The Great Gatsby" is ultimately one of my favourites ever (yes, I have watched it six times already) and it pretty much sums up my favourite era, the 1920s. The costumes were spectacular, which were designed by Luhrmann' s wife, Catherine Martin, alongside Prada and this proved to be a winning combination. Daisy Buchannan's dresses always have me starry eyed watching the film, and the lilac lace dress and crystal party droplet dress were sheer perfection. So this what I would wear if I were going to Gatsby's party. Everything I'm wearing is vintage, including my mother's pearl necklace and mint green heels (I did buy them to go in my vintage shop, but I just couldn't bring myself to let them go!). 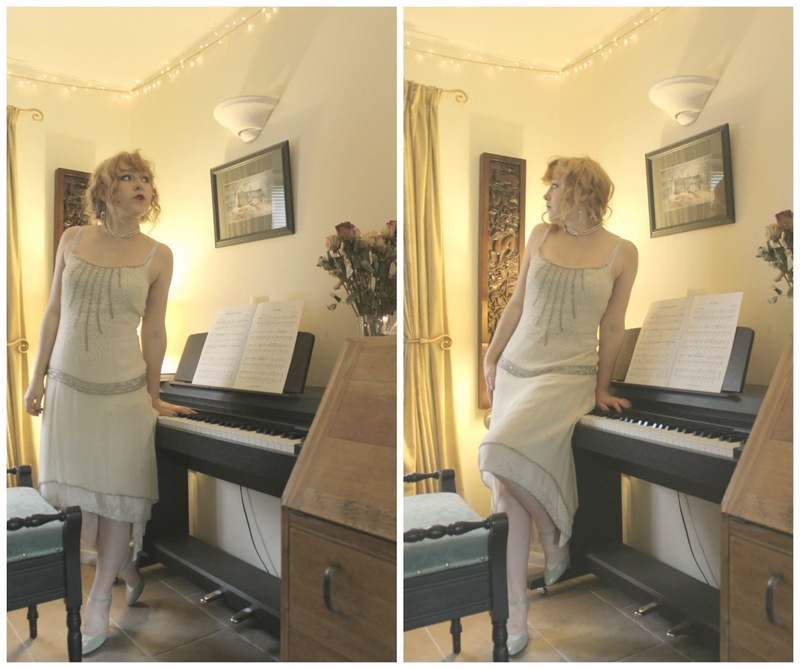 The dress I picked up recently from Wells Vintage fair- it is a fairly modern remake of a 1920's dress, however it looks authentic and features a layered skirt, hanker chief hem and really pretty beading too. I'm planning to wear this on my 18th next year, which will be 1920's themed as well! Hair and make-up wise, I might need a little bit more practise before then! I haven't perfected the finger waves of a true twenties flapper yet, so I simply curled my hair and pinned the back up to give a faux bob- albeit quite messy! I did a smoky eyes and used a deep burgundy red lipstick to recreate the iconic Cupids bow lips which were popular among the ladies of the 1920's. And finally, here's a little mood board I made featuring glamorous evening dresses from Farfetch, strings of pearls, silver jewellery and also a few make up swatches (click here for links to all the products). After all, a girl can dream!